Max Guests: One guest to 1 couple. Other: Minimum French level B1. Private studio. Pets welcome. 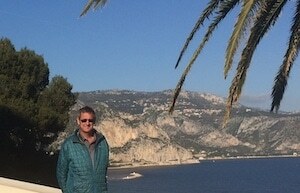 Ahhh, Nice… The French Riviera. Geneviève welcomes any level of French students and will be your host and guide for an exceptionally rich French immersion experience. Her apartment is ideally located in downtown Nice, within walking distance of the beach, shopping, museums and restaurants. If you prefer to be a bit more independent, you can stay in her cozy studio, and still benefit from daily French classes and time together. With French culture surrounding you, you’ll progress in no time! Bonjour, my name is Geneviève and I am a native French teacher with a Master of French as a Second Language. It’s been almost 15 years now that I have been teaching French to foreigners, and I must confess that I have not yet got tired of meeting new students and sharing my beautiful French language, my country and my Frenc way of life with them. My program is very flexible, and can be quite intensive, for students preparing the DELF or DALF exam for example, or lighter for people who wish to have more free time to explore the region of Nice, with me or by themselves. I will be happy to welcome you alone, or two people traveling together. Please note I no longer teach children and prefer teaching intermediate and advanced levels. My apartment is right in downtown Nice, within walking distance of the beach, shopping, restaurants, daily markets and museums. It is only a few minutes walk from the train station and several bus stops, which makes visiting the city and the surrounding region very easy. You will have your own spacious room with your private bathroom and access to the living area of my flat and the terrace for sunbathing, reading and relaxing. If you prefer, you can stay in my studio apartment, conveniently located just across from my apartment! 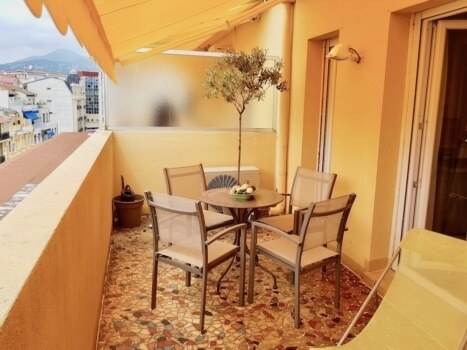 Your studio features a large balcony with a table and a great open view over the hills of Nice, a sofa/reading area, a comfy double bed, a bathroom with a shower and toilet, and a fully equipped kitchen with a sitting bar area and a washing machine. It can accommodate up two people sleeping together. 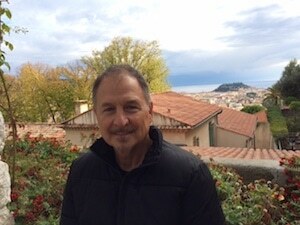 Next to my house, you’ll find the cities of Monaco, Monte Carlo, Menton, Vence, Grasse, St Paul de Vence, Cannes… There is so much to see and do that I can’t list it all! I specialize in teaching high intermediate and advanced levels, and preparing students for tests such as DELF or DALF: although I am fluent in English, I use French in the classroom so you are really immersed in the French language. I no longer teach children, sorry. I have no pets and I can only accept a very well behaved small dog if you are staying in my studio. Since my apartment and your private studio are located in the heart of Nice, there is plenty of public transportation around and you don’t need to rent a car if you don’t want to. Note that I live very close to the train station. There is free access to Internet. I don’t smoke and smoking is not allowed in my apartments. Private studio across from my flat, on the same floor, or stay in a spacious room with private bathroom in my apartment: your choice! Breakfast and dinner with me – I love to cook and you are welcome to assist me if you’d like while we speak French! There are many things to do around here, and I’m always open to suggestions. The price for this option for one person is 1600 Euros per week. Entries to museums, lunches outside during our excursions or unplanned activities you wish to add to this program are not included in the price. I’m very flexible and will be happy to arrange whatever you’d like: so just let me know if there are other things you are interested in. Euros 800 with shared lessons and excursions. I can welcome up to two people traveling together. I can give lessons to both guests, however I often host couples and give formal lessons to one person as the other one goes for a walk, then we all meet for dinner and practice French together. When you do an immersion with me, you’ll benefit from a minimum of 5 hours of guided French conversation a day. Of course you’ll have some free time to discover the region, but we’ll also spend a lot of time together and you’ll get plenty of French practice. Follow Geneviève’s Bilingual Articles On French Today’s Blog, Where She Talks About Her Beautiful Region. 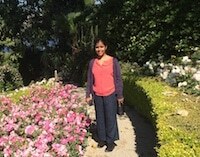 I recently returned from a wonderful twelve-day “sejour” in Nice with Genevieve. I was born to two French parents and grew up speaking French but over the past 20 years have had essentially no opportunities to speak and wanted to my French back up to snuff, so to speak. The stay got off to a great start at the airport, where I was met by both Genevieve and her very charming sister and I felt immediately at ease as they were both very warm and welcoming. They gave me a brief night-time tour of the beautiful city before bringing me to the studio where I would be staying, which is conveniently literally next door to her apartment. I was pleasantly surprised by how spacious and well-appointed the studio is and I felt very comfortable and at-home during my almost two weeks there. For my first full-day Genevieve had already planned an outing to see a parade since it was Carnival time in Nice. The day following this outing is when the lessons (a.k.a work) formally started, with a test to asses my written French level. Using the test results Genevieve was easily able to spot the holes in my knowledge of French grammar and prepare lessons plans. 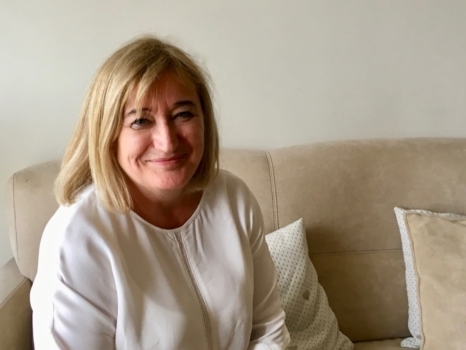 Genevieve has a significant amount of experience teaching French and it really shows in that she is easily able to adapt her style to match the needs of her students and is a very kind, enthusiastic and patient teacher. One aspect of the experience to highlight is the level of immersion Genevieve is able to provide. We spent a significant amount of time together each and every day, whether it was during lesson time, meal-time (she is an amazing cook and will prepare meals to suit any taste), or on outings and I spoke essentially no English for almost two weeks which was amazing. 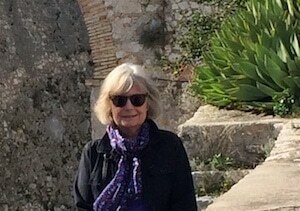 Genevieve is also an excellent guide and I was able to see many of the beautiful sites around the city, including the fort/castle, the beaches in Nice and neighboring areas (Villefranche-sur-Mer where we had a wonderful picnic again with her very funny sister), and the old city and port. Additionally, she possesses very deep knowledge of regional culture and cuisine and introduced me to many of the best local culinary delights by taking me out to eat at charming local restaurants off the “beaten path” that would have been hard for me to find on my own. Although I could easily go on and on, I will end this short essay by saying I loved every minute of my sejour. I made dramatic impartments in both my written and conversational French over the two weeks which would be very hard or almost impressible to replicate at back home in California. 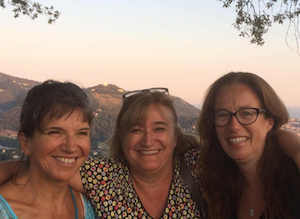 Gevenvieve is a delightful person and wonderful teacher, and I can’t wait to go back – I’m already planning my next trip to Nice with her as there is still so much to learn, see and experience! I had a wonderful time with you and in Nice. You were very welcoming and hospitable, picking me up at the airport, taking me to lunch and the Rothschild’s Villa, and providing a very convenient, clean studio to stay in. I found Nice to be an excellent and interesting centre for me to prowl around either on foot, bike, bus or train, including up and down the coast. Despite my (too?) many years of lack of practice in French, you were clear, direct and very supportive. I did not feel at all inhibited or embarrassed but think I became increasingly confident and capable as the week progressed. The grammar lessons were a challenge but very useful and necessary! My goal for the week was to brush the cobwebs off my knowledge of French and see what really was left there. I was pleased that I had better recall than expected and, more to the point, I enjoyed relearning it too. So, in this, the trip was very successful. My question now is where I go with this – more immersion, more time in French-speaking places – to be determined. So, overall you provided a very comfortable but actually quite demanding environment to help me greatly improve my confidence in speaking French. I feel I learned a lot of French and got to know a very attractive part of France. Very many thanks – and apologies for not writing this in French! I have had the most wonderful week under Genevieve’s tuition. It exceeded all my expectations. Genevieve offers a perfect balance between structured teaching, French conversation and the opportunity to experience everyday life in Nice. She kindly took me on walks and tours but I also enjoyed the opportunity for some personal exploration around the town, which has great museums and fascinating history to discover. I stayed in the studio next to her apartment; it was a delightful pied à terre and Genevieve cooked a delicious meal every day – even providing for my vegetarian preferences. 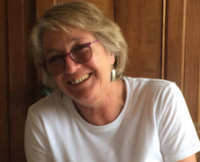 Genevieve is delightful – very easy to get on with, has a lovely sense of humour and was always sensitive about whether I was happy with the pace of teaching and conversation, much of which was usefully based on current events, as well as subjects one would naturally chat about with a friend. All this was with kindly correction when necessary! I really do feel more confident now about speaking French and I wholeheartedly recommend this immersion experience in Nice with Genevieve. Wow! What an amazing two weeks I had studying French with Genevieve, sharing her delicious cuisine, and getting to explore Nice and its entourage. I was delighted with my living quarters, which was a modern studio right next to Genevieve. The location is a stone’s from the Promenade des Anglais and the train station. My French improved dramatically. There were several aspects of French grammar, which despite my years of study, had remained more or less a mystery to me. That was until Genevieve got hold of me. Thank you Genevieve! I came back to the USA, encouraged and excited to continue my study of French and the culture that goes with it. The excursions with Genevieve were just plain fun. It doesn’t hurt that she knows the area and its history so well, and enjoys sharing it. 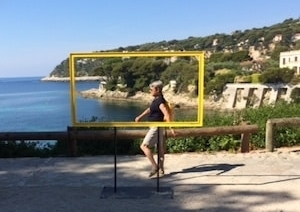 Whether it was walking along the Promenade des Anglais or the coast of Cap Ferrat; sharing a delicious seafood dinner; visiting the beautiful Rothschild villa and gardens; shopping for artisanal gifts in Villefranche sur mer . . . . .(you get the idea), it was magnifique! I envy those of you who have this wonderful experience ahead of you. Fyi: I am a 67 year old retired school teacher from Arizona. I had been doing adult French classes for many years but the emphasis was not on conversational skills. I have fairly good vocabulary but lack the confidence to have conversations or discussions in French without stopping and starting. Although I am of intermediate standard my comprehension ability is also very poor. 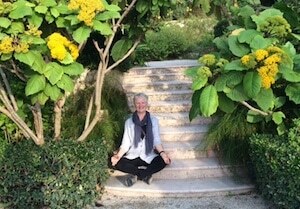 As it happened my husband and I were planning to spend a week in Nice in September when I thought that if I went the week before, then I could do an immersion course. It was a wonderful moment to forget about the lack of courage, make a decision and just ‘Do it’. Genevieve offered to collect me at the airport but I wanted to find her apartment by myself. This was an excuse as I really wanted to practice speaking French en route to bolster my confidence before diving in ‘at the deep end’ and so my adventure began. From the minute I entered her lovely apartment she made me feel at ease. I stayed in her studio apartment next door which was beautiful, modern, and bright. It had everything I needed including a sunny balcony with a friendly collared dove (une tourterelle) who came to visit every day. 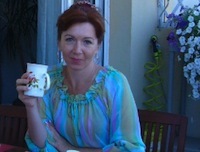 I had breakfast in Genevieve’s apartment at 8.30 am and every morning I had delicious natural yogurt which she makes. She gave me her recipe and now I make it all the time. Breakfast was followed by three hours of French where she quickly found my weaknesses. I felt I could express myself fairly well in general conversation with Genevieve but I’m sure she slows down her speech to suit the situation. I think she was a little surprised at my comprehension inability when listening and understanding spoken French on ipad. One week of immersion does not help this but it creates a goal to overcome it. On my free afternoons I could come & go as I pleased. This gave me my time to explore the area by myself and make my own mistakes. I find the French people so helpful and kind particularly when an effort is made to try to speak their language. An immersion is tiring and saturation happens but it is all so worthwhile. I would love to do another course with Genevieve. I was sad to leave at the end of the week as Genevieve had become my friend and I loved our conversations. 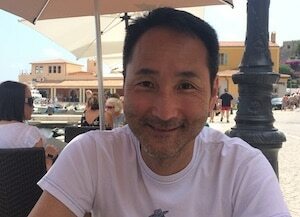 I began my 2nd week with my husband near Nice for the next adventure and with a new found confidence. 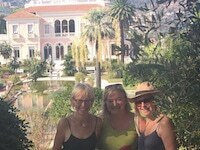 Thank you Genevieve for everything and for the lovely lunch on the quay side in Villefranche not forgetting the visit to the stunning house and gardens in Villa Ephrussi de Rothschild. My wife and I spent a week with Geneviève, although I was the only one studying French. All of the reviews on Geneviève’s website are extremely positive and absolutely true. Yes, Geneviève is an excellent teacher, guide, cook, and a wonderful human being. We worked on grammar, listening, and of course lots of speaking. My wife and I had our own studio apartment adjacent to Geneviève’s. 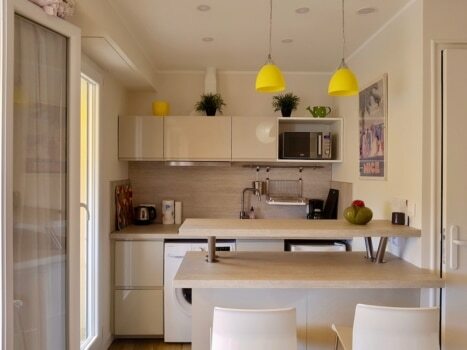 The apartment is lovely and situated a short walk from the sea and the tram. We had our breakfasts in the kitchen and our dinners on the outside balcony. The food was always fantastic. My listening and speaking skills improved significantly. 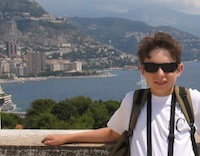 We spoke French during meals, 3-hour lessons, and when we went on excursions of the old city and Villefranche-sur-Mer. My wife doesn’t speak French, yet she felt welcome, and Geneviève spoke English to her, or I would translate. We both had a wonderful experience in Nice with Geneviève, and I would absolutely recommend her to a friend or come back myself for another week. I have not had the chance to properly thank you for your kind hospitality and patient tuition during my two-weeks stay in Nice. You are indeed a very effective teacher, experienced in tailoring lessons to students’ needs, and then imparting knowledge at appropriate skill level and pace. 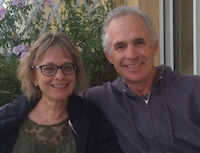 For me, a retiree student who started French almost too late in life, who struggled to comprehend spoken words, and who was too inhibited to converse in a foreign tongue, my time with you proved a transformative experience. Our daily lessons were, for me, intense. Grammar, listening and conversation in equal parts where in each you taught and guided with considerable patience (and perseverance!). Amazingly, I could feel my progress on a daily basis! By the end of term, listening was no longer a jumble of distracting sounds and I was able to discern discrete words (that, understandably, not all were comprehensible to me). And, I had shed much of my inhibitions to speech, grammatical or otherwise. A big thank you, once again! Away from the classroom, you are a pleasure to be around. Wise counsel as ever, practical and always leading the charge, like, I imagine, Joan of Arc, but with an exhilarating sense of humour! And finally, it remains for me to thank you for your ratatouille recipe that I have yet to put to the test at home in Hong Kong. I will add mushrooms despite your protestations! I had a wonderful time during my week of French immersion in Nice with Geneviève. I stayed in the studio apartment adjacent to hers which was clean and had a beautiful view of the city. The apartment itself was very nice. Geneviève picked me up from the airport and brought me back to the apartment. This was my first time traveling to France on my own but I immediately felt comfortable with her. She fed me very well and let me try new dishes including une salade niçoise, crème brulée, and ratatouille. In terms of the French lessons, every weekday we had 3 hour lessons where I practiced reading, writing, listening, and speaking exercises. She makes sure you practice all 4 skills but will focus on the skills you specifically want to improve, if need be. Geneviève also took me out on excursions and provided me with everything I needed in order to see the city on my own. She is very knowledgeable about her city and better than any tour guide! Nice, in general, is a nice city, It has an expensive reputation as the stores can be pricey. I thoroughly enjoyed my week with Geneviève but a week was definitely enough time to spend in Nice, especially as the French immersion can be quite demanding. I would highly recommend this homestay. By the end of the week I saw improvements in my French accent and I started to think in French. You couldn’t ask for a better host, teacher, and guide than Geneviève. My stay in Nice with Geneviève for a week was quite amazing. Firstly she was waiting for me at the exit gate of the Nice Airport. She took me to my apartment studio, which was clean and tidy, whose balcony facing to the city through to the Mediterranean Sea. I really enjoy staying there. 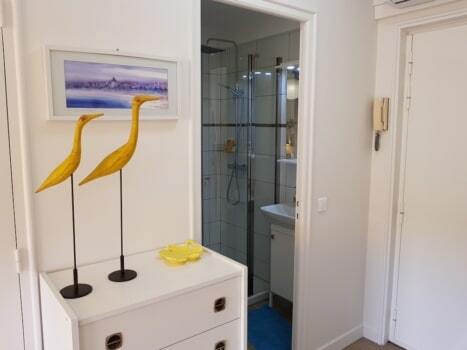 It is located minutes walk from the central station and was convenient to move around Côte d’Azur. Geneviève is a French teacher who has great experience and she immediately found my level. Her lessons was focusing on enhancing my skills in all aspects. By the end of 5th day, although it was only 1 week stay, I found myself able to talk more in French and understand what people are talking around myself in town much better. After Nice, visiting other several cities in Europe, I went to Paris. What made me so happy was the fact that people in Paris this time kept speaking to me in French rather than English! I know my French is still yet to improve further; however, one week stay with Geneviève gave me a tremendous opportunity for me to use French language throughout my stay and it gave me a lot of confidence using French. Apart from her lesson, Geneviève is great cook. I was looking forward to her dishes every evening. Breakfast was also my enjoyment. As I told her that I love croissant and pain-au-choclat, she went in the. morning to a boulangerie who makes best of them. I promised her on my departure that I would return to Nice once I got B2 DELF, and now this is my new motivation to continue with studying French. Thank you very much for your great help throughout my stay in Nice, and see you again! We have just returned from a wonderful week staying next door to Genevieve in her light & comfortable studio with magnificent views over Nice. 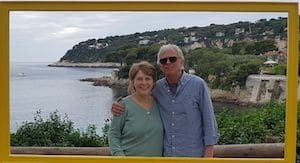 We are a couple wanting to improve our French and explore Nice. Genevieve met us at the airport and all week made us feel welcome, cooking some delicious meals for us and taking us to local sights and to savour Niçoise specialties. We also had time to do our own thing too! Genevieve is a sensitive and skilled teacher who is able to identify and quickly adapt to her students’ learning needs. We learnt loads and had lots of laughs and fun too. I had a most enjoyable week chez Genevieve, she was so hospitable that I soon felt at home in her flat and her meals were delicious. The flat is very central and close to station, trams, buses and to the sea. I wanted an immersion course and that is what I got, – from breakfast right up to bedtime everything was in French. Lessons in the morning, included much needed grammar, but even more what I wanted and needed was to talk. Genevieve used many different methods and had the skill and ability to encourage me to do this. Two afternoons Genevieve took me on excursions, firstly to Old Nice and the other day we went to Madame Rothschild house and gardens. Another afternoon I was taken on a history tour of ancient Nice, by Chantel, leaving me only two afternoons to explore on my own and there is so much to see and do. I spent one really enjoyable evening with some of Genevieve’s family, as they were celebrating her cousin’s birthday. It was a real joy to meet them and to be a part of their celebration. Thank you Genevieve for such an enjoyable week spent in improving my French. What a great way to learn and speak French. My week with Genevieve was time and money well spent. My French level is intermediate at best, lots of vocabulary but more than a wee bit skinny on grammar. My goal was to comprehend and be comfortable speaking on a daily basis and travelling solo. Genevieve is clearly an ace at French as a second language. My daily homework was to listen to contemporary news broadcast, and to relisten reading the transcript. We chatted over breakfast and then 3 morning hours beginning with discussing the news, with various digressions and then grammar with excellent handouts . She uses grammar as a tool, rather than intimidation, although it wasn’t exactly fun, it did make a lot of sense. Genevieve has a great sense of humor and certainly lots of patience! Her apartment is lovely and spacious, I stayed in the studio next door, which was very pleasant, airy and sunny with its own balcony, complete with two turtle doves who visited daily!. Very comfortable bed, sofa and a great shower. Genevieve is an excellent cook, she makes her own delicious yogurt, which was my breakfast preference with fruit and yogurt and of course coffee. I had either lunch or dinner with her, and for meals on my own, I could have prepared something in my well equipped kitchenette, but was too tempted by the foodies paradise of Nice. (highly recommend also the African bistro across the street for takeout). The apartment couldn’t be better located, 5 minutes by foot to the sea and Promenade des Anglaises. A 45’ walk to Musee des beaux Arts and Musee des Arts Naifs in one direction and in the other direction to Musee Matisse and Chagall. Of course you could take a bus… Also have option of some cardio at apartment on 7th floor (there is an elevator). The best part of my week was spending time chatting and excursioning with Genevieve, including dinner with her brother, and a bonus play one evening with friends at a tiny theater. Lots of practice with the day to day comprehension that is so essential, and so difficult to master. I absolutely love Nice, it is truly a gem of a city and the natives are very friendly ( I managed to get lost several times). The art and music scenes are very dynamic. Geneviève is a great teacher, very structured in her approach and flexible. She started with a full assessment of my french level so the course was effectively tailor made for me. She also has an amazing range of resources available and not only teaches well but she’s got a great sense of humour and is really friendly. It goes without saying that Nice is a great place to stay but Geneviève knows it so well and is so knowledgeable that I discovered loads of new places even though I’d visited Nice several times before. And Geneviève also went out of her way to cook vegetarian food for me! Thank you for everything, Geneviève. I had a fantastic time and learned loads. 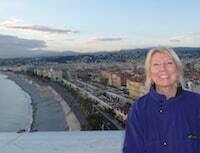 I had a beautiful stay in Nice, France and had the wonderful opportunity to study with Genevieve. She is a terrific teacher who encouraged me and motivated me in a very positive way. The variety of teaching strategies she used were effective and helped me to develop confidence in my language skills. In addition, the lodging was more than adequate, comfortable, clean, and situated next to her home. We took several field trips that were enjoyable, interesting, and educational and afforded me even more experiences to practice my French. Thank you Geneviève for a terrific two weeks. I hope to return soon. I wanted to say how useful and enjoyable I found the immersion week I spent with Geneviève in November in her lovely apartment. She was very welcoming and made me feel relaxed throughout my stay. Geneviève was very organised and tailored the 3 hour session in a structured way to meet my learning needs but also was flexible enough to adapt to enable me to pursue matters that arose spontaneously. 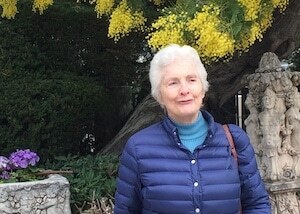 She provided me with great ideas of what to do in Nice in my free time and the two outings organised by her were very enjoyable and informative. Geneviève was a great host even cooking good vegetarian food for us all week. 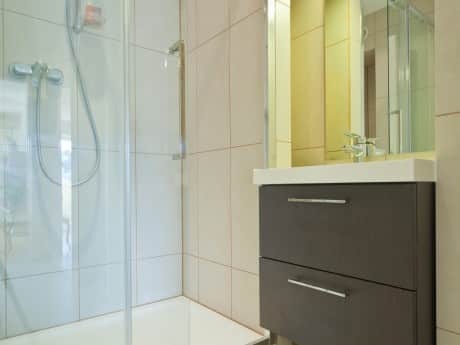 The apartment is very comfortable and I felt very comfortable sharing your living space. We seemed to chat non-stop and she was always supportive and encouraging – helping me improve my french and build up confidence. I have read over the last few years of bucket lists. The circumstances of my life changed and there were suddenly things that could be done. Would I be brave enough to do something on my own? 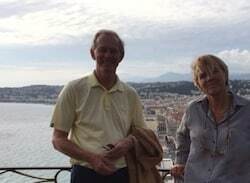 The delightful Geneviève fetched me from Nice airport and what a fantastic adventure. We studied for three hours every morning. I arrived with very hesitant French but by the end of the week I suddenly realized that I was not translating. Better than I could have hoped for. I even learned how to think in the correct tense! I had my own bedroom and shower room in G’s apartment and it was very very comfortable. Watching TV lying on my bed and reading subtitles in French is very good for you and your comprehension. Realizing you are walking ‘ Promenade des Anglais’; a dream come true! Geneviève was such a great help to me in my French language acquisition efforts! I was looking for a program where I could speak only French (no English!) all week, while continuing in my language learning with an experienced teacher. Geneviève fulfilled these requirements – and more! Her hospitality, coupled with her teaching (and cooking :)) skills made it quite an enriching week. I highly recommend her program to anyone wanting to take their French language to the next level. Thank you so much, Geneviève! ‘Yes, I was nervous to say the least when I arrived in Nice. The french I had learned in my one hour weekly french lessons for the past 18 months seemed to evaporate the moment I stepped off the plane and sheer panic set in. Help! What on earth was I doing? Once I had met Genevieve panic receded. I felt very relaxed in her company. I wasn’t going to gain any significant fluency in one week but I needed to gain confidence to just have a go. Knowing in my head what to say but just not being able to get the words out was my biggest problem. Not once did I get the impression that Genevieve was bored with my very limited conversation. Instead, she encouraged me to have a go, ask questions and most importantly have fun in the process. Morning lessons were well structured with grammar, reading, listening to french news and even singing some french songs! Those three hours each morning would fly by. The apartment was clean, bright and modern as was my room. The location was perfect, close to shops, sights and the beach. Genevieve is a great cook and meals were tasty and varied, always finishing with cheese and a desert!! I left Genevieve with a desire to continue, confidence to try and some wonderful memories. I will certainly be returning (sorry Genevieve!) armed with the knowledge that my being fluent in french one day is actually possible, it’s all about confidence and persistence. I spent 2 weeks with Geneviève in May 2017, learning french and discovering Nice and the surrounding area in my free time. This was my first time travelling on my own but I was never truly alone. The mornings always began with a cheerful “bon matin” from Geneviève and petit déjeuner on the terrasse. This was followed by 3 hours of very useful french lessons. Genevieve quickly determines where your weak points are and works on them. Then it was free time, either with Geneviève or on my own. 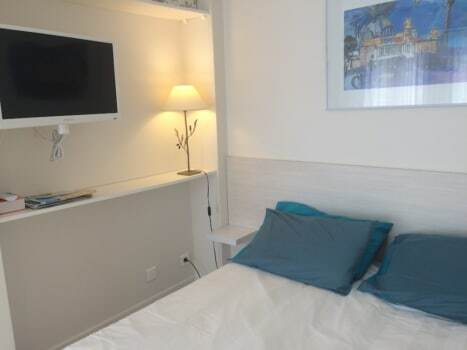 The apartment is bien situé, close to the train station for trips to Antibes and Monaco. It is also a short walk to the ocean and the Veille Ville de Nice. After a day of exploring it was back home for diner sur la terrasse. Genevieve is a wonderful cook. The delicious meals and the lively conversation were a great way to spend the evening. All in all this holiday was a great balance of study and vacation. I recently returned from a cruise in Northern Europe. 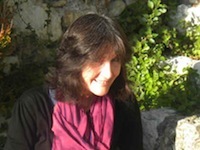 Having seen a promotion in Camille’s French Today newsletter for a new language teacher added to her stable of home-stay tutors in France, I checked her existing options and found Geneviève in Nice. I contacted Geneviève online and because I was booking 12 months in advance, we were able to reserve the week prior to my cruise. It was not until friends asked me about the details that I realised I had jumped into the unknown. So it was with some trepidation that I fronted up for my one-on-one experience. I need not have worried! Geneviève is the perfect host, with a room and its own bathroom in her lovely apartment that was so comfortable, and her gourmet cooking an added bonus. She is a thoroughly professional teacher, very patient and supportive. I still wonder if she really understood as I prattled on in French over the dinner table! I saw that many of her students stay in contact from all around the world and a longer stay in the future looks very tempting. There is nothing wrong with Nice either! I recently spent a fantastic week with Genevieve in Nice. My level of french is Advanced and my aim was to prepare for the DELF B2 exam while, of course, speaking as much french as possible. Both these aims were amply fulfilled by Genevieve with great good humour and attention to detail. The mornings started with chat over breakfast followed by an exploration of current affairs in France and elsewhere using an excellent website which I have continued to use in the UK. This was followed by grammar exercises and explanations which were really helpful in finding the “holes” in my grammar knowledge. Genevieve has a very flexible approach so that when a difficulty is encountered she quickly produces exercises on the topic to ensure that the point has been understood. Lunch was taken in a restaurant with her twice during the week and followed by 2 outings – both of which were fascinating. The first to Eze, a beautiful hill village with amazing sea views with obligatory visit to chez Fragonard for some retail therapy! The second was an informative walking tour of Nice including the Castle at the top, again with great views. The apartment is very centrally situated in Nice – 5 minutes walk to a delightful old fashioned French cinema and a further 5 minutes walk to the sea with both the new and old town very close by. I was free to use her very comfortable apartment during the day if I wished for extra study etc. We then met up again for supper in her apartment – always delicious – followed by television and conversation until bedtime. 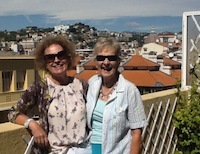 My friend and I have just returned from spending a wonderful week in Nice with Geneviève. For the last year Dot and I have been meeting once a week for an hour to practice our French. Whilst this has been good we felt we needed a new impetus in order to take a leap forwards. We found Genevieve online and decided it was exactly what we needed; complete immersion for a week with a native speaker! Geneviève is the perfect host, from meeting us at the airport even though her car had broken down and she had to enlist her sisters help, to serving us delicious food each day and answering all our touristy questions. Now to the most important part; Genevieve put us at our ease and we spoke French with her from the moment she met us at the airport to when she dropped us back again a week later. This does not mean Dot and I were speaking wonderful, grammatically correct French all the time (or even most of the time! ), but we were able to just have a go and not feel inhibited when we got it wrong – which we did frequently! Over mealtimes we just chatted the best we could with help from Genevieve when needed. By contrast the morning lessons were more structured; Genevieve asked which areas we wanted to concentrate on for the week and then drew up lessons accordingly. Afternoon excursions with Genevieve were very relaxed, very interesting and again helped to extend our French vocabulary. In the evenings after supper we would spend some time watching French films so that by the time we collapsed into bed each night we were definitely ‘thinking’ in French! Most importantly the three of us got on so well and spent a lot of time laughing which made the week so much fun and definitely memorable. 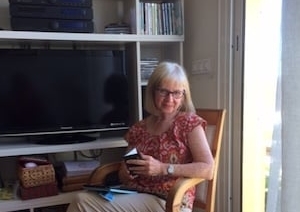 Dot and I came home having had a wonderful trip away in sunny Nice having achieved our objective of taking a confident leap forwards with our French – all thanks to Genevieve! Geneviève is a wonderful teacher and human being. My husband and I stayed at her studio apartment, which is just half a block down the street from her own place. 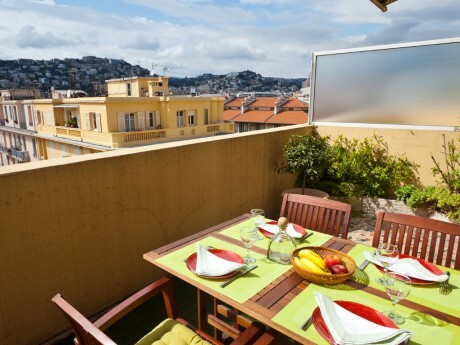 It is the perfect little apartment: nice and sunny, and it’s also within walking distance of many of the sights in Nice. As a bonus, it also is equipped with a washing machine. Geneviève is good at zeroing in on what a student needs most. She also laid out a two-year “game plan” for me on what I need to focus on in order to advance more rapidly in my French studies – and it’s working! It was so nice to have that connection with a local person who could help me with my French, show my husband and me the sights, and either cook an excellent meal for us or take us to a restaurant frequented by locals in order to sample some of the local fare. An immersion experience with Geneviève is well worth the time and tuition. Although I was traveling with my husband and staying in Geneviève’s studio apartment, this would also be a great experience as a solo journey, staying with Geneviève in her own apartment rather than the studio apartment down the street. Geneviève, you are awesome, and our stay in Nice was over the top! I have recently returned from a 2 week stay, studying French, with Genevieve. I was nervous prior to my arrival as I didn’t know what to expect. From the moment Genevieve collected me from the airport she put me at ease with friendly conversation and a warm welcome into her home. My bedroom was large and bright, with plenty of cupboard space, an air conditioner/heater and a TV. I also had a private shower and basin. The lessons were spread over 5 mornings. Afternoons were spent either exploring Nice and it’s art galleries or sightseeing with Genevieve in nearby towns. I used my 2 days off in the week to train to towns further along the coast. Although I had good comprehension of French before I went to Nice, I lacked the confidence to speak. Genevieve was so friendly and encouraging that I soon got over my reluctance to speak. It doesn’t take long before you realise that you are not thinking of what to say in English, mentally translating into French then speaking, but just automatically speaking French. The immersion method improved my language skills considerably and having Genevieve as my host and teacher made it enjoyable and entertaining. “As a pensioner, I was anxious about booking a week’s French Course of total immersion, but I need not have worried. Genevieve welcomed me warmly and soon sorted a programme to fill some of the gaping holes in my knowledge of the French language – she is a very good teacher. She created delicious vegetarian suppers for me in between practising the Ukulele. 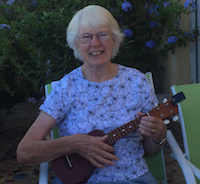 Yes, I gave her a few lessons and homework as I have just joined a Ukulele U3A group. I came into this as one who did not start learning French until after I was 50 and, although I can get by in restaurants and simple conversations, I have struggled with rapid or complex conversation. A week spent one-on-one with Geneviève provided an enormous learning experience for me. Just the fact that I heard and spoke only French was extremely helpful, but Geneviève provided several hours each day of intensive instruction–much of which will take me weeks or months to truly incorporate into conversation, but the structure and knowledge are now in my head and only practice will move me onward. It was a week well spent. Bonjour from Texas! 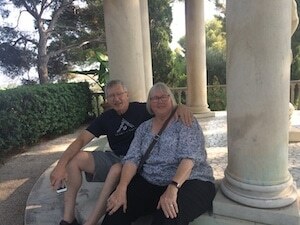 I have just returned from a week in Nice studying with Genevieve and I can’t say enough good things about my stay. Firstly, the instruction was top-notch. Each day she assessed my needs and tailored the day’s lesson to me. At the end of the week, she gave me suggestions of online and print resources that would help me on my road to fluency. I spent my afternoons and evenings (after I completed my homework!) exploring Nice and the riviera. Genevieve took me on several excursions that fit my interests. We explored gardens, a chateau, and a parfumerie. I had the pleasure of staying with Genevieve for 2 weeks in December 2015. A last-minute opportunity arose to stay with Genevieve when a cancellation provided an opening – how fortunate for me was that cancellation, as Genevieve is a very busy and sought-after teacher! My French was very rusty with significant holes in my understanding and application of the language. Genevieve quickly focused on my weaknesses and tailored her teaching to those areas. Genevieve’s generosity as a teacher and a host is truly special. The set teaching hours seemed to fly-by each day, so enjoyable were they, and so filled with an appreciable improvement in my grasp of the language. The true value of an immersion course is that learning does not stop at the end of the dedicated lesson time, but continues non-stop throughout the day for the duration of the stay. My only complaint is that I was not able to stay longer and improve further! 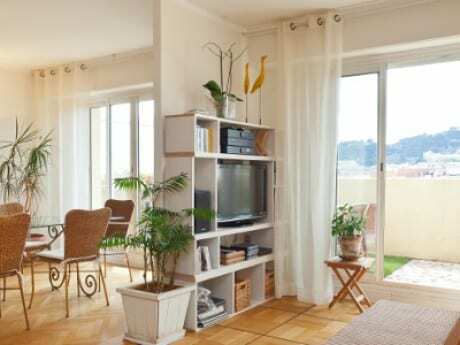 Genevieve’s apartment is well situated to take advantage of Nice and the surrounding area and region, and it is so easy to get about by walking and public transport. There is so much to see and do in Nice itself, and the region in general, and the expeditions that Genevieve arranged were true highlights (and another indication of Genevieve’s generosity, as I know that she had done these things many times before, but still managed to make these visits so enjoyable with no sense of any sort of boredom on her part – a true achievement). 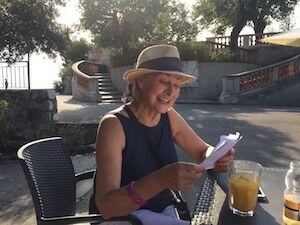 Genevieve also met – without a hint of any sort of difficulty – my dietary requirements (vegetarianism in France is perhaps not the easiest thing to accommodate), and provided restaurant quality meals, always varied and always flavourful. In short, this was a marvellous holiday, combining dedicated language instruction with a wonderful, personalised insight into a beautiful city and beautiful part of the world, under the guidance of one of the nicest and most professionally dedicated people you could hope to meet. I am busy saving my ‘sous’ and planning for a repeat visit, though I know I will have to take my place in the queue! develop my language skills, correcting my pronunciation, and improving my grasp of verb conjugation. At the start of the first week, I lacked the confidence to speak more than a few basic phrases, by the end of the two weeks I felt a lot more confident, and prepared to have a go, I no longer panic, and run a mile when anyone speaks French to me! 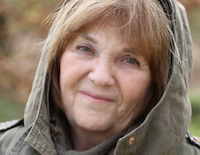 Geneviève is warm, funny and generous, I enjoyed every aspect of my time, and wished that I could have stayed for longer. 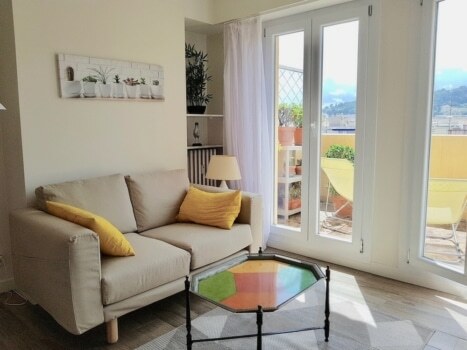 Nice is a beautiful city to explore, and Geneviève’s apartment is ideally placed. 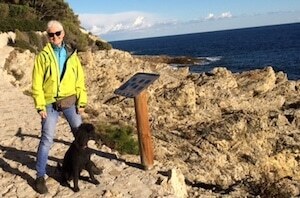 I enjoyed the excursions especially the visit to Eze village, and St Jean cap de ferrat. Geneviève adjusted to my level of french, but also pushed me to make lots of progress. This was the perfect course for me, as I knew that in a group of students that I wouldn’t have spoken so much. This immersion course pushed me out of my comfort zone, which made it even more rewarding. I learnt so much from Geneviève about French culture, and language, and it was an absolute joy to spend two weeks in her company. First and foremost, she is an outstanding teacher. Her communications skills are extremely good. There were times when I just wasn’t understanding and she patiently rephrased and worked with me until I did. Within two days I found myself thinking in French and totally able to communicate with people that I came in contact with during the course of the day. My self confidence soared and I enjoyed my interaction with everyone. She inspired me to do well and was responsible for my new found ability. Geneviève is an excellent teacher and hostess. She adapted very well to my level of French. Here is a bright, capable lady that takes charge. I thought that three hours a day might be too much, but it wasn’t. 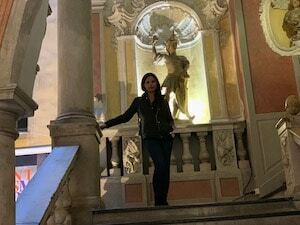 The days are flexible, we even went by train to Monte Carlo for a day trip. Most of the time she spoke in French, unless I made a funny face because I didn’t understand her. Nice is beautiful, I would love to live there. There’s always people outside. Their growing season is about nine months, so all the fruits and vegetables are ripe. The meals had a lot of variety. Genevieve’s French Immersion program is a definite must for anyone interested in taking their French communication skills to the next level. It’s almost too difficult to put into words how valuable my week with Genevieve was. My immersion began the moment we met at the airport and continued on 24/7 from there! Paying particular attention to my goals and language needs, Genevieve created my customized curriculum, which included conversation, comprehension, reading and writing. Through Genevieve’s instruction I have broken the many erroneous habits and pronunciations I have learned through the years and have now learned the proper way to communicate and have been able to build out my toolbox of skills so much so that much of my French conversation comes from thinking in French, rather than thinking in English and translating to French. But, my 5-day immersion program didn’t stop when my morning lessons were done. Whether sharing a meal, touring through city and beyond or guiding me to the best spots the coast had to offer, Genevieve was the ultimate hostess. 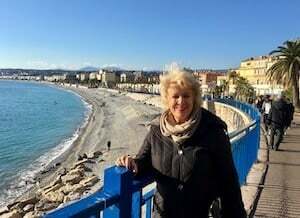 A native of Nice, Genevieve provided me with an insider’s view of her beautiful city and the surrounding areas and went out of her way to make sure my stay was special. I cannot begin to say how grateful I am to Genevieve for the time we spent together and the skills that I gained, which stayed with me throughout my time in Paris, speaking only french and which have stayed with me now that I’ve returned to the states. Additionally, she is an intelligent, thoughtful and wonderful woman, who it was a pleasure to get to know and who will be a part of my world from now on. I stayed with Geneviève for one week in March 2015. The class far surpassed my expectations. Geneviève is a wonderful teacher. She was encouraging, patient, and was very quickly able to assess my ability, and tailor the course to match my needs. In addition to being an excellent teacher, Geneviève is a warm, kind, fun (& funny!) person. In no time at all, I felt at home with her – and by the time I left, it was as though I was saying à bientôt to a friend ! Geneviève, merci pour votre temps, votre patience, et votre amitié ! J’ espère qu’un jour, je peux continuer mes leçons avec vous! 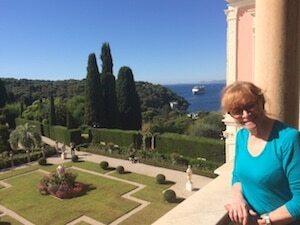 I’ve just returned from a fantastic week in Nice Genevieve! I went completely unprepared, hoping Genevieve would have some ideas to help me improve my French. And she did! Although officially “classes” started after breakfast, practicing French started from the moment we said “Bonjour!” every morning and lasted until we said “Bonne nuit.” What’s more, Geneviève showed me some excellent apps I had no idea existed, so now I can listen to the news in French at home – still quite a challenge for me! After just one day, I knew THIS IS IT so I arranged immediately to come back. My entire stay simply couldn’t have been better! What a week! My stay with Genevieve was a great adventure and so much fun. I had always wanted to study French in France, with a goal of overcoming my timidity and reticence in speaking. Genevieve’s course was perfect for me because we could focus on conversation instead of grammar (although I needed some help here, naturellement!). We spoke French all day long, starting with a discussion of current events each morning. Genevieve was always exceptionally patient with me and encouraging. Of course, one week was not enough time for a complete transformation, but I made great progress. The course exceeded all of my hopes and expectations. My only regret? Not having spent two weeks with Genevieve. However, I feel that I’ve found a new friend, and I’ll just have to return next year to continue my studies! Thank you for the time with you in Nice – one week for Annika and also a second one for Filip. Annika: When we came I must admit I was a bit affected by all the comments I had from colleagues – What, are you going on vacation to study French?? They didn`t say: Are you out of your mind; but the message was pretty clear. So I was wondering if we had made the right choice? They were wrong and we were right. We both like to have something meaningful to do during vacation, and the balance between our morning lessons, dinners or lunches + the tours in Nice and the free time we had was perfect. For us it felt like vacation even if we tried to work hard – to be able to concentrate on just one thing is truly relaxing as an antidote to the everyday working life. We hope you agree with us when we say, we think we both learned quite a lot. After speaking so much French one feels more feel more confident and it is much easier to speak, which is a huge step forward in itself. And as an extra bonus we learned more about the area. It is so much more rewarding to see a place through the eyes of someone who lives there than as a complete outsider. All in all we are very pleased with our stay – happy to come back another time. The three days I spent in Nice were just incredible as I took an immersion course with Geneviève and I lived in her apartment. Notwithstanding that I have studied French for almost a year at a language school in Lyon and having also passed my C1 exam, the course with Geneviève still helped me a lot in putting into practice what I have learnt. We spoke a lot during these three days as we had breakfasts and dinners together, in addition to having a three- hour class each morning. It was my first time in Nice and I visited the town during the afternoons. This was the best way of traveling in France for me as I lived with someone who is not only French but is also a very good teacher who could correct me every time I spoke the language incorrectly. I was also completely immersed into the local culture and I didn’t feel like just another tourist. Geneviève is a very good host and she made me feel very at ease ever since the first day of my arrival. She is also a very animated person. Not only have I spoken French and learnt a lot in these three days, I have also laughed a lot. On my last day, she drove me to Villefranche-Sur-Mer where we spent half a day like friends. My stay with Geneviève in Nice has become one of my best memories in France. I spent a week with Geneviève at her bright and lovely home. I studied French on weekday mornings and explored the region the rest of the time. Geneviève was recommended to me by a friend and she has all the qualities to which the testimonials attest. She is very professional, a good teacher who tries to understand what you need and to make the best use of your time. 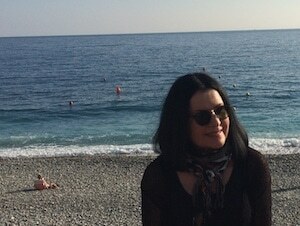 I must confess that I had moments of strong anxiety the day that I arrived in Nice. I asked myself how I could spend a week with a person I did not know at all. Would we get along? What on earth would we talk about? But I need not have worried. Geneviève is very hospitable, a good cook with a down to earth sense of humour. She took good care of me and our conversations turned out to be more than mere exercises in French. We talked constantly about everything – cooking, travel, family life, even touching on religion and politics. And she introduced me to my two new favourite foods, socca and beignets d’aubergines. I didn’t have any homework, which might seem to be a defect in a French course. But I was on vacation, visiting Nice for the first time, and wanted to spend my free time exploring the delights of the du Côte d’Azur. If I had been working towards a certificate, I would have had to allow more time for study. It’s worth discussing the goals at the very start and reviewing them from time to time. The program is flexible, and depends to a large extent on what you ask for. All in all, a week of immersion in French language and culture in the incomparable Côte d’Azur turned out to be one of my most memorable vacations. This past April, I had the pleasure of meeting Genevieve and participating in her Learn French program. From the moment we met at the airport, I could sense her professionalism and attention to detail. I only spent a week with Genevieve, which was not enough! From the get go, she encouraged me to try and to make mistakes. She has a great ear, and promptly created lessons tailor made to my difficulties. While Genevieve is undoubtedly the best French teacher I have had, she is also delightful, charming and very down to earth. 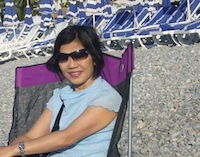 Her teaching style, coupled with the lovely setting of Nice and the French Riviera made for an unforgettable experience. 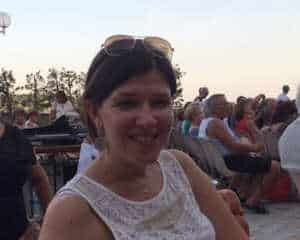 When searching for a French immersion course, I quickly choose Genevieve, partly because of the personality I sensed from her website and partly because I wanted to return to the French Riviera. During my two weeks in October 2013 studying with Genevieve, my hopes and expectations were met. Genevieve is a delightful, playful person and a competent teacher who tailored the morning classes to my level and needs. Another thing I appreciated was her good-natured response to my bringing her a cold that extended for both of us nearly to the end of my stay. Nice and the surrounding areas offer many options for spending afternoons after class on one’s own. Complementing my time with Genevieve, each day I chose a different city in the area to visit by bus. 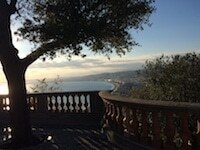 To the west, I went as far as Cannes and to the east, Menton. My love of art drove most of my decisions. After revising some points of grammar which we were finding difficult we had other activities. Genevieve is a good hostess and after the week Joan and I agreed that our grasp of the French language had improved, and we had really enjoyed our visit! Je voudrais remercier Geneviève de son accueil amical. Mon fils et moi, nous avons vécu chez elle pendant deux semaines en août 2013, mon fils a étudié en cours individuels avec elle. Geneviève est très bon professeur, elle a l’expérience et elle choisit la méthode d’l’enseignement qui répond au niveau, aux buts et aux caractéristiques de l’élève. En vue de la préparation au DELF B2 , elle a bien réuni les 4 parts de l’enseignement des langues: l’expression et la compréhension de l’oral, la production et compréhension des écrits , en outre, elle a trouvé le temps de parler de la culture française: Mon fils a entendu des chansons françaises populaires, les textes étudiés étaient sur la vie des Français et de leurs problèmes. Si nous avons beaucoup amélioré notre niveau du français c’est également grâce aux conversations pendant les dîners. D’ailleurs, Geneviève cuisine très bien, elle nous a toujours cuisiné quelque chose de nouveau, nous avons ainsi pu connaître bien des plats français très intéressants (maintenant je les cuisine en Russie). Pendant ces dîners magnifiques (qui se passaient sur sa terrasse, au coucher du soleil) nous avons parlé de thèmes différents, notamment, de l’art, de la littérature, de la vie quotidienne en France… Nous avons reçu une bonne expérience du français parlé. 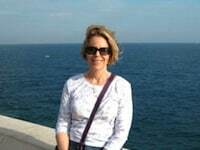 “I greatly enjoyed the private French lessons with Geneviève . She specifically designed an intensive three-week French course to help with my transition to Luxembourg, in pursuit of new job opportunities. The lessons were practical and focused on essential French vocabulary and grammar. Each lesson was carefully prepared and started with the revising of the previously learned material which greatly facilitated the learning process. I appreciated that Geneviève included some topics relevant for my professional life, such as money and banking. Geneviève explained the French grammar clearly and often made comparisons with other languages; this certainly helped to understand the peculiarities of the French grammar. She had a great sense of humor which made each lesson fun and enjoyable! From the moment I sat in the plane Moscow Nice, I thought, « My God, but what did I have invented How am I going to understand my teacher when I’m not talking french well? But all my fears disappeared as soon as I met Geneviève at the airport. I lived with her for two weeks in September 2012. It has been a wonderful time! Her apartment is spacious and bright. When I arrived in my room, I opened the window and I admired the view, the sun, the tiled roofs, small mountains and the birds singing. It was superb. She showed me the rest of the apartment and the terrace where we ate all our meals. Every morning we planned our day. As it was the month of September 2012, I was able to enjoy the beach when it was not raining. Every day we did grammar, vocabulary and discuss about various themes. 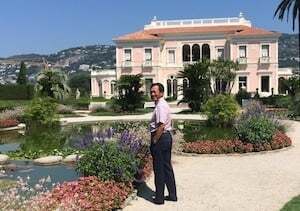 I also remember our trip by car in Villefranche sur Mer and our visit to the Villa Ephrussi de Rothschild with its musical fountains in the garden. It was beautiful!. 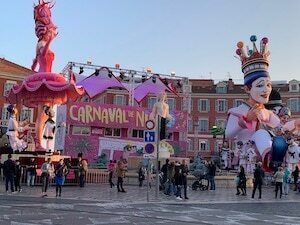 I love Nice, I’ve been three times, but during this last visit I really deepened my French, I could see how the French live, I was immersed in their daily lives. I spent a good two weeks and it was sad to leave. Geneviève cooking was another story: If you don’t stay with her and she doesn’t need anymore holidays, she could easily became a chief in a restaurant. 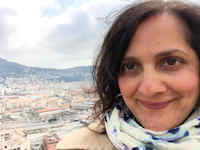 When I just arrived at Geneviève’s apartment in Nice, I was very nervous and apprehensive at the idea of staying two weeks in Nice to learn French. But right away, Geneviève made me feel very comfortable at home. The atmosphere was very relaxed, and I was free to go wher ever I wanted, as long I took the Keys.!!!! During my stay with her, I did the course for three hours every morning, some days we went to very nice places and always with lots of things to do and see. Also I met a lot of nice people, which helped me a lot gaining confidence to speak French all the times with everybody. And the food, I won’t even mention !!!!! Each meal was different and every one was delicious. All these things combined made for a wonderful sejour. I had private french lessons for 4 weeks with Geneviève . I needed to learn the French language for my work. When I arrived in Nice, I couldn’t speak any French. I knew ONLY « Hello, How are you?, My name is Koji and I am Japanese. « Thanks to her courses and conversation , I got the ability of communication quickly. I was really proud when I could communicate in a restaurant, a bakery and market. As my biggest goal was to have the ability of basic communication, the individual lesson with Geneviève was the best choice for me. She corrected my errors my granmar and pronunciation. I improve so much in so little time. The apartment where I stayed in the heart of Nice was very accessible Nice is ideal for learning the French language with the mild climate . The cooking was delicious and various: not ONLY my level of French but my waist expanded. Thanks to her, my four weeks stay was a very rich experience. My name is Brenda. I live in San Diego, CA. I spent two weeks with Geneviève in the autumn of 2012 and the whole experience exceeded my expectations. Geneviève is an excellent teacher as well as a gracious host and wonderful cook. Geneviève challenged me and encouraged me and gave me the tools I needed to improve my French proficiency. The instruction I received was well-tailored to the areas in which I needed improvement. Geneviève has a way of building one’s confidence as she builds one’s knowledge. In addition to studying the language it was such a pleasure to be immersed in the French way of life. Geneviève’s french lessons are cultural as well as grammatical. I look forward to returning to study with her and maintaining a friendship with her. I am missing your wonderful cooking. I did make a Salad Nicoise on the weekend – but it is just not the same. Mealtimes were always fun with a variety of people to talk to and practice with. It was really wonderful staying in your very lovely home. An extra bonus I had not considered before going is how close your home is to all the attractions in Nice. I walked everywhere and it made the vacation all the more enjoyable. This was a great vacation for me.